According to the English newspaper Liverpool Echo, a window cleaner was walking with a friend along the banks of the River Mersey when a mysterious creature was found. Cryptozoology is the study of animals whose existence has not been confirmed by the scientific community. Cryptozoologists, those who work in the field of cryptozoology, investigate popular sightings and legends of these mysterious animals and look for evidence of their existence. The people who work in this field spend most of their time trying to establish theories that can explain the supposed sightings of these creatures. Nowadays, cryptozoology has become a popular interest and is even the subject of many television series. However, the academic community does not recognize cryptozoology as a true science. Instead, it is considered a pseudoscience, which means that it does not follow the scientific method. As I mentioned earlier, the term cryptozoology is used to describe animals that supposedly do not exist. Many of these creatures come from folklore and other local stories, but their legends remain alive with the help of sightings that continue to this day. Some of the best-known cryptids around the world are the Bigfoot, the Loch Ness monster and the Chupacabra. But what many people are unaware of, is that apart from investigating the most popular legendary creatures, cryptozoologists are also interested in those “monsters” that appear overnight from dead bodies on beaches or rivers. Like the mysterious dead creature that was found last Thursday afternoon on the banks of the Mersey River, northwest of England. Although nobody has been able to explain what it is, some experts suggest that it could be a dolphin, a porpoise or just a giant fish, while others believe it could be the remains of a prehistoric creature. According to the English newspaper Liverpool Echo, a window cleaner named Sean Hall was walking with a friend along the banks of the River Mersey, when a mysterious creature was found. The first thing they thought when they saw it was that it was a seal that was having problems and could need help to get back into the water. But when Sean and his friend approached, they saw that the strange creature was dead. Although what caught their attention was that they had fangs and their skin was vicious to the touch. In addition, Sean, 28, said the creature did not even have eyes, which is extremely strange to an animal, reminding the prehistoric river monsters. Quickly, Sean and his friend contacted several animal organizations to identify the mysterious animal, but none of them was capable. However, when the experts saw the images of the creature, they were baffled. Dr. Leonie Robinson, professor of marine biology at the University of Liverpool, said that since the animal was in poor condition, most of its characteristics to be identified had been lost. He mentioned that, according to the images, it could be anything from a porpoise to a big fish. Dr. Robinson also claimed that the creature must have died a long time ago since its head seemed to be rotten to the jaw. An expert from the Royal Society for the Prevention of Cruelty to Animals (RSPCA), which specializes in animal rescue and promotes the cause of well-being for all animals, has said that the unknown creature most likely has a link with dolphins and porpoises. 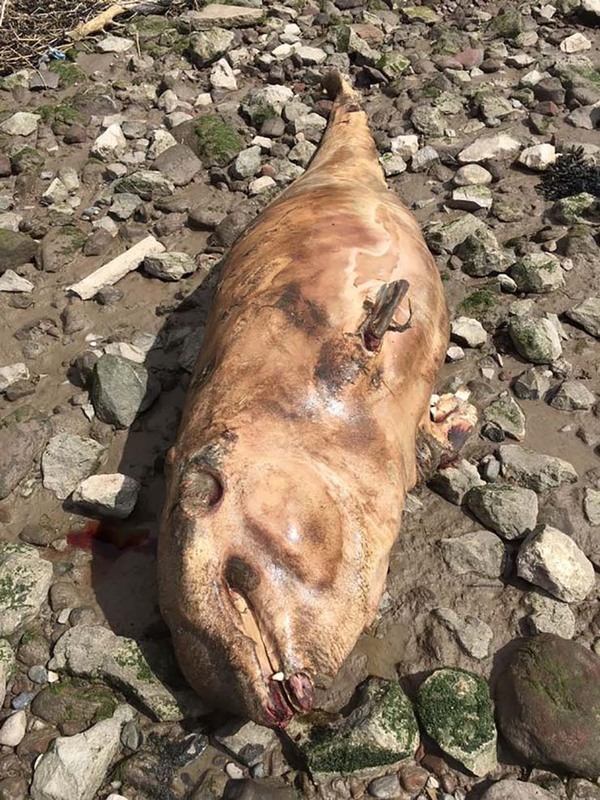 However, RSPCA has forwarded the details of the strange creature to the local council, which is responsible for the elimination of dead animals and incidents related to the strandings of cetaceans, and which investigates such cases. However, the scientific explanation has not satisfied everyone. There are many who believe that it could be a prehistoric creature that has managed to survive over the centuries without being identified. And others believe more in conspiracy theory, suggesting that it could be the remains of an animal that has been created or genetically altered in secret government laboratories. These are other possibilities. Pretty clearly a cetacean of some sort.